Visit Yosemite National Park to experience one of the first of America’s wilderness wonderlands and to view amazing waterfalls, ancient Giant Sequoias, lovely meadows, tranquil valleys and spectacular granite formations. Yosemite National Park is nestled within the Sierra Nevada Mountains of California, just minutes from many bustling cities, and where visitors can get a taste of the majestic splendor of Mother Nature. Covering 1,170 square miles and containing mountains ranging from 2,000 to over 13,000 feet in elevation, this park offers numerous services and conveniences for all travelers, a bonus to all the natural wonders that await you here. Yosemite spans three counties in east central California, across the western slopes of the Sierra Nevada mountain range. If approaching from the west or north, you can get to the park on Highways 120 or 140 (from Manteca or Merced). From the east, coming from Reno, Lake Tahoe or Las Vegas from May through October (depending on conditions), you can enter the park from US Highway 395 to Highway 120 headed west into Yosemite. From the south, Highway 41 takes you into the park. Yosemite Nat Park is open all year. Yosemite Natl Park has such a wide variety of activities available to visitors it’s simply impossible to list them all in one small space. But here are just some of the things you can enjoy - giving you just a hint of all the adventures you can have in this world-famous park. Here you will find the largest stand of Giant Sequoias in Yosemite. This collection of historic structures in Wawona is well worth a visit to learn of some of the history of this incredible park. Glacier Point presents you with a commanding view of High Sierra vistas, including Yosemite Valley and Half Dome. Take the Tioga Road to Tuolumne Meadows to see the beauty of this lovely sub-alpine meadow, surrounded by mighty peaks. A great start for backcountry hiking, Hetch Hetchy Valley is a great place to get away from the crowds. This 2,425-foot cascade is the most popular falls in the park, with three separate waterfalls making up the spectacular drop. You can even hike to the top. This waterfall flows all year, but it’s best to visit in May when the snowmelt makes it even more incredible. Hiking to Venal Fall is something that many visitors do to really get up close to this 317-foot waterfall. See this lovely waterfall from a distance at Glacier Point. When hiking to Vernal Fall, you can continue on the trail to Nevada Fall. Half Dome is likely the most sought-after sight within Yosemite, towering almost 5,000 feet above the valley. To see it up close, take a two-mile roundtrip walk on a paved trail. Rising over 3,000 feet, this monolith is not only a favorite for rock climbing, but is a view you won’t want to miss when in the park. You can catch a great view of it from Bridalveil Fall and at Tunnel View. Witness breathtaking views of three different waterfalls and the Yosemite Valley from Glacier Point. Some say this is the best viewpoint in the entire park. Look out over Yosemite Valley from the east from this popular overlook on Tioga Road. Seeing Tuolumne Meadows from this viewpoint on the Tioga Road affords visitors a lovely way to see this amazing meadow surrounded by towering peaks. 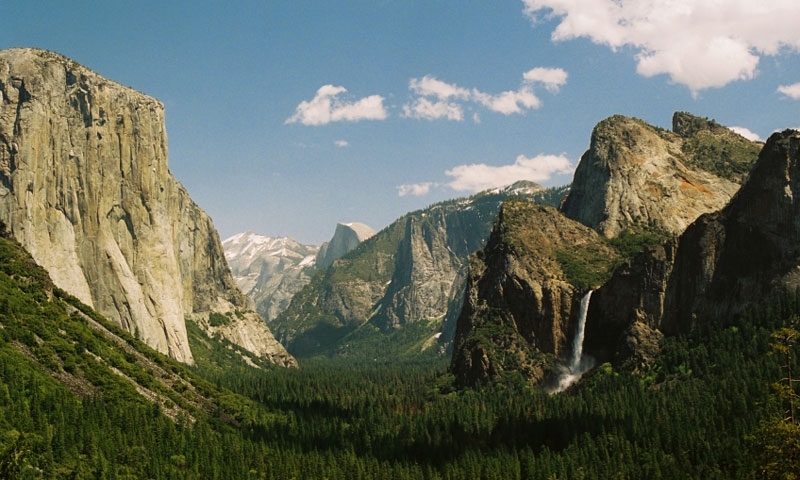 Yosemite Valley is probably the most popular place to start out on day-hikes within the park. A great one is hiking to Bridalveil Fall, an easy .5-mile walk on a paved trail. There are a number of hikes that start in this area, but one that is especially enjoyable is the one to Sentinel Dome and Taft Point. This moderate 2.2-mile roundtrip hike takes you through wildflower-filled meadows and to some lovely views. Starting at the Wawona Hotel, take the Wawona Meadow Loop for an easy hike of about 2 hours. Or you can try another easy hike, the Swinging Bridge Loop, a 4.8-mile hike from the Wawona Store taking you across Swinging Bridge. Lookout Point and Wapama Falls are both moderate hikes that are fun for anyone. The Lookout Point Trail will provide you with some great views and the Wapama Falls Trail takes you to the base of this lovely waterfall. You can fish for rainbow, brook and brown trout from the shore on this beautiful reservoir. Cherry Lake fishing offers catches of brook, brown, rainbow and even some Kokanee salmon. You’ll be able to fish Don Pedro Lake from your boat or from the shore, catching catfish, Black bass, trout, bluegill and more. Anglers love the Merced River because you have not only great fishing, but also incredible scenery as a backdrop to your fishing adventures. Yosemite Park is well known for the Wawona Tree, also known as the Tunnel Tree. This famous Giant Sequoia was 227 feet tall and 90 feet in circumference. During the late 1800s and early 1900s, horse-drawn carriages and early automobiles used to drive through a tunnel cut through its trunk. In 1969, the tree fell in a snowstorm. It was estimated to be around 2,300 years old.